Erving Goffman died 36 years ago, in 1982, but his work is still frequently cited (Google Scholar documents 260,399 citations as of this writing) and he is certainly remembered by many. This is a meditation on when we remember to think of (and credit) the originator of an idea, and when we don’t, and what difference it makes. The first publication of Goffman’s that I ever read was Frame Analysis, published in 1974. I entered graduate school at the University of Pennsylvania in 1975, and the bookstore was highlighting campus authors. This book is not the standard route to Goffman – although he considered Frame Analysis his crowning achievement, others critiqued it. The book is long and convoluted, often cited but rarely read. At the same time, it provides an essential resource for anyone wishing to understand framing. Goffman credits Gregory Bateson with developing the concept of frame analysis in “The message ‘this is play’” in 1955 (reprinted in his 1972 edited collection Steps to an ecology of mind). Bateson was writing about animal vs. human communication, but he emphasized the general way in which framing serves to define context and organize perceptions of behavior. Bateson linked framing to metacommunication, usually defined as communication about communication. In both cases, what’s at stake is stepping outside the current interaction in order to ask a larger question about what’s happening, and how it is being understood. Both are used to convey information about a message: a frame shapes the way something makes sense to participants (teasing vs. serious behavior, for example) whereas metacommunication refers to the behaviors specifically used to shape that understanding (so that a change in vocal pitch may indicate teasing). Goffman expanded the concept of framing from Bateson’s initial concern with animals to social interaction among humans, suggesting that people use frames to help them answer the basic question of “What’s going on here?” He also introduced a highly elaborated set of related technical vocabulary (primary framework, keying, track, breaking frame, lamination, transformation, fabrication, etc. ), and many of these terms have been adopted by later authors. The example of teasing vs. serious behavior given earlier would be a matter of what Goffman calls shifting “key,” referring to basic assumptions about the way in which behavior is to be understood. At the same time, people are complex, and so Goffman proposed multiple “tracks” occur simultaneously. For example, the “disattend track” includes backstage activities designed to facilitate interaction and maintain a frame, but which are rarely the focus of attention. The cooks in a restaurant or the photographer at a wedding serve as obvious examples. Similarly, “directional signals” provide critical information while rarely becoming the focus of attention. An obvious example here would be punctuation marks in writing, or an audience member calling out “speak up” when the speaker cannot be heard. “Breaking frame” is when one participant unexpectedly leaves the frame while others still inhabit it – as when laughing at someone who intended to be serious (or the reverse, taking someone seriously when they intended only to tease). 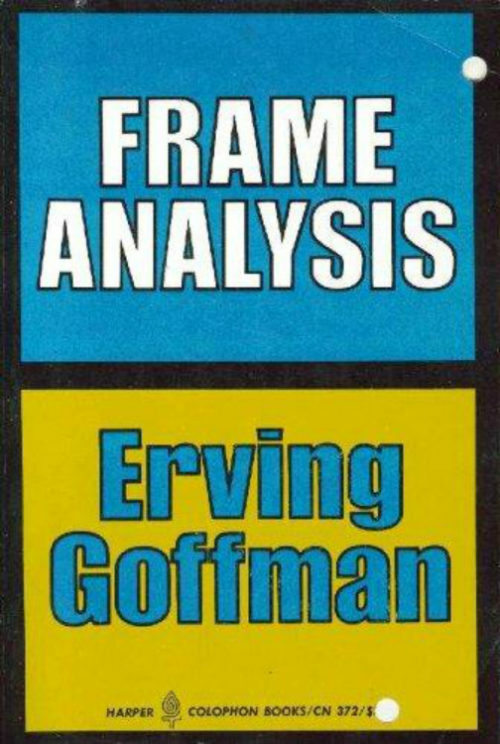 Cover of Erving Goffman’s 1974 book, Frame Analysis. Harvard University Press, used with permission. Today, Bateson is occasionally mentioned when discussing the concept of framing, as the one who first used the term and was acknowledged for it, but it is Goffman who is typically mentioned as the central inventor of the idea, perhaps because he was the one to write an entire book on the topic. At least that’s how it works with interaction scholars – across multiple disciplines (at least in Sociology, Communication, Linguistics, and Anthropology, those being the disciplines I mostly read). However, something odd shows up when reading media scholars, whether they are affiliated with Communication or Sociology. Early publications (mostly 1990s) on the concept of framing mention Goffman (though not Bateson, or at least not that I’ve seen). But even a few years later (1999 and on), Goffman has disappeared entirely from most discussions of his idea. Of course, some authors do still cite him, but what prompted me to think about this were the multiple sources that do not cite him when I would have expected to see some acknowledgment. Academics are carefully trained to acknowledge their intellectual predecessors. We consider it plagiarism when someone is not credited with having an idea that influenced us. We tend to think that success means that people adopt your ideas, and also that they will credit you with having had them in the first place. That is typically accepted as evidence that we have influenced others, and therefore that is how most of us wish to be remembered. However, this example of Goffman and his concept of framing as adopted by media scholars provides an alternative possibility: perhaps when your ideas are fully absorbed into the culture they are no longer acknowledged; perhaps that is the greatest sign of influence, and therefore, despite appearances, actually the best way to be remembered? Featured image credit: Memorys by Yusuf Evli. Public Domain via Unsplash. Wendy Leeds-Hurwitz is the author of the entry on “Erving Goffman” in Oxford Bibliographies in Communication, as well as another in the International Encyclopedia of Communication, and co-author of Erving Goffman: A critical introduction to media and communication theory with Yves Winkin. She is Professor Emerita of the University of Wisconsin-Parkside and has been Director of the Center for Intercultural Dialogue since 2010. 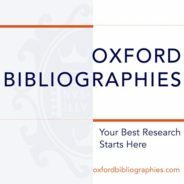 Further discussion of disciplinary history may be found in her edited collection, The Social History of Language and Social Interaction Research: People, Places, Ideas.